Last year, Ram Truck kicked the full-sized truck industry in its pants with the introduction of its game-changing 2013 Ram 1500 V6 and the Ram 1500 line went on to win just about every major award offered to trucks in the U.S. Then, this last February, news broke that Ram was planning to offer an industry-exclusive diesel option for its light-duty 1500 pickup (read more here). Now that diesel option is confirmed and brings with it a best-in-class fuel efficiency and far lower price point than most would have anticipated. The 2014 Ram 1500 will offer the tried-and-proven 5.7-liter HEMI V8 with Fuel Saver Technology and variable-valve timing (VVT), outputting 395 horsepower and 410 lb-ft of torque. The 3.6-liter Pentastar V-6, voted one of Ward's 10 Best Engines, will also continue its run at 305 horsepower and 269 lb-ft of torque output. Both of these gasoline options can be mated to the new eight-speed TorqueFlite transmission that is also winning awards and spreading its efficiency gains throughout the Chrysler lineup. Those gasoline options will be joined by a new 3.0-liter V6 EcoDiesel which features 240 horsepower, 420 lb-ft of troque and a specialized version of the eight-speed TorqueFlite made for the diesel's output. This option will have better towing power than the V-8 HEMI and will have the same 5 year/100,000 mile warranty as its gasoline brethren. Speaking briefly with Nick Cappa of Ram Trucks, I was told that they are expecting best-in-class fuel efficiency for the diesel option (not hard to imagine), but that they haven't received EPA numbers yet and so are not yet announcing any official MPG ratings. Ram expects to have those sometime this month or early next. Unofficially, he says, they are expecting numbers that will "blow minds." As for price points, the EcoDiesel option will be only $2,850 higher than the base model V-8 HEMI, which starts at $24,200 for the 2014 model year (plus destination). Also new for the 2014 model year on all Ram 1500s will be a front park assist system (a popular option in Chrysler's Jeep line) and pulse-width modulation (PWM) which reduces electrical load to improve fuel economy by up to 0.4 percent. PWM is being added to other components as well, including the climate control system which has a variable displacement compressor for the air-conditioning. A VDC has the added advantage of reduced noise and smoother transitions. Adding to this, the 2014 Ram 1500 is the first in its class to use the new, environmentally efficient F1234yf refrigerant for reduced greenhouse emissions. 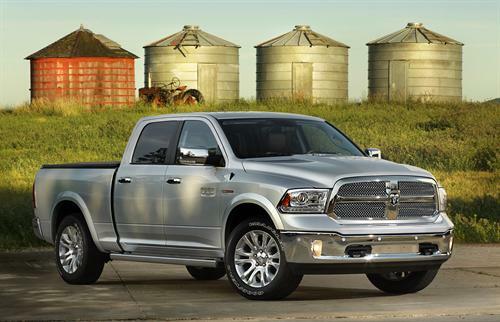 The 2014 Ram 1500 EcoDiesel will be built in the Warren, Michigan plant where all Ram 1500 trucks are made, with the exception of regular cab trucks, which are made in the Saltillo, Mexico plant along with most of Ram's commercial vehicles.